The spiritual companion of the Geek Girl Con panel “Changing Culture in Mainstream and Alternative Spaces” was a discussion of the problem of bullying in the cosplay community and possible solutions. Via George Takei and Fandoms and Feminism (full text). 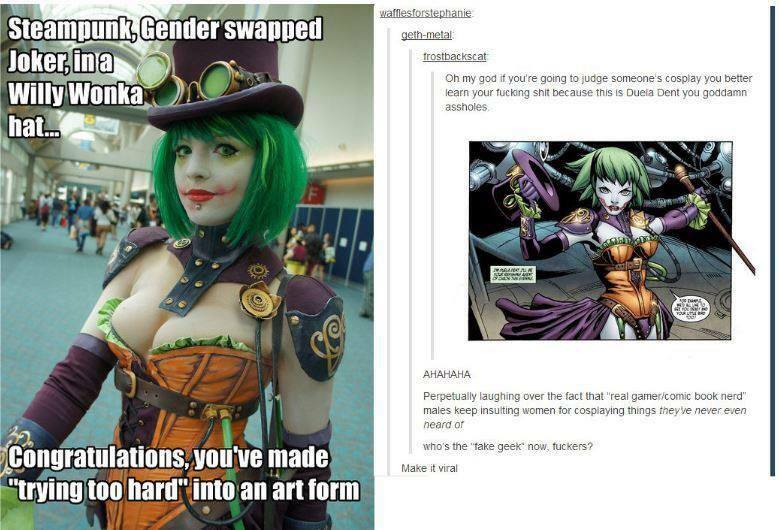 Image: meme-maker accuses Duela Dent cosplayer of “trying too hard” in a “steampunk gender-swapped Joker in a Willy Wonka hat.” Tumblr users give the OP what for. From 4chan to Tumblr, the Internet has created an anonymous forum where belittling and trash talk have become the norm, and standing up for someone isn’t noble. In this panel we will be discussing the types of bullying prevalent in the cosplay community, the concept of “white knighting,” our own personal experiences with bullying, and how bullying is affecting attracting potential cosplayers. With panelists Christopher Vance, Erin Gose, Katie Murphy, Lauren Crosson, and Son Young Yu; moderated by Stephen Wilson.